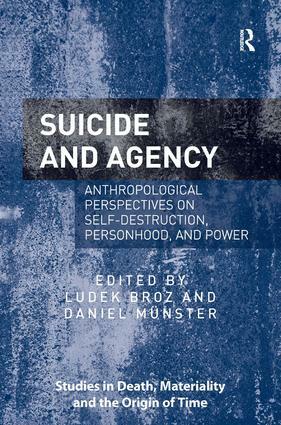 This volume makes an important contribution to scholarship on agency in suicide. It offers ethnographic perspectives that complicate mainstream understandings around the transculturally persistent practice of self-killing. However, as it describes living through and with suicide, it adds more. As Strathern notes in her afterword, this volume not only contributes to understanding suicide and agency through local ontologies, but also shows how suicide tells us about aspects of social life. Ludek Broz is a researcher at the Institute of Ethnology, The Czech Academy of Sciences, Czech Republic. Daniel MÃ¼nster is a junior research group leader in the cluster of excellence 'Asia and Europe in a Global Context' at Heidelberg University, Germany. Eventually we all die - and we experience death head-on, when someone close to us dies. This series, Studies in Death, Materiality and the Origin of Time, identifies this fact as constitutive of the origin of human conceptions of time. Time permeates everything, but except for time itself all things are perishable - yet, it is only through the perishable world of things and bodies that we sense time. Bringing together scholarly work across a range of disciplines, the series explores the fact that human experiences and conceptions of time inherently hinge on the material world, and that time as a socially experienced phenomenon cannot be understood as separate from material form or expression. As such, it departs from a persistent current within Western thinking. Philosophy, biology and physics, among other disciplines, have studied time as an essential, ethereal and abstract concept. In the same way, death has often been conceived of in abstract and sometimes transcendental terms as occupying one extreme margin of human life. As an alternative, this series examines the ways in which bodily death and material decay are central points of reference in social life, which offer key insights into human perceptions of time.